In 1892, Dr. Rudolf Rempel patented a clever system for food conservation that did not require any additives or chemicals, such as salt, acids, ethanol, or sugar, be added to food for this purpose. This method quickly became famous around the world when it was successfully commercialized by Johann Weck, as in the Weck jars with the typical rubber rings.1 Chances are great that a simple and reliable system for eye drops will become as successful in the world of ophthalmology as the Weck jar was in the food arena. The wider use of eye drops started in the 1960s with thiomersal-preserved drops out of small glass vials. Thiomersal is an organomercury compound with antiseptic and antifungal properties. It was very effective, but quickly caused a number of severe side effects attributed to this preservative, and multidose droppers were switched to benzalkonium chloride (BAC).2 BAC is much better tolerated; however, recent scientific evidence makes it obsolete, in particular for treatment of chronic ocular diseases.3 This generated a demand for cost-effective multidose eye drop delivery systems that allow preservative-free formulations for long-term treatments, such as chronic dry eye and glaucoma. There are a few systems on the market, which claim to work without any preservatives, but not all systems are as pure and innovative as the Weck jar. Therefore, the following will serve to review the current available systems. 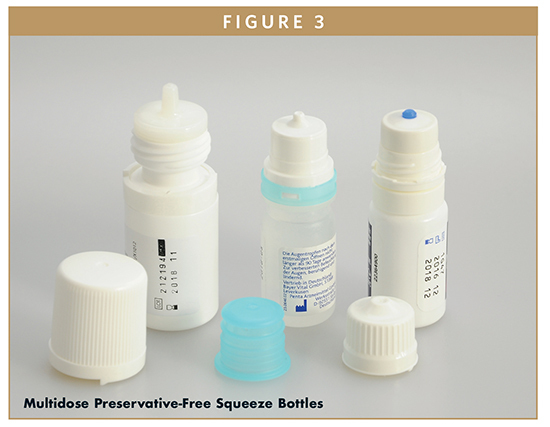 One of these is Aptar Pharma’s Ophthalmic Squeeze Dispenser (OSD), a multidose dropper that relies solely on mechanical measures to prevent microbial contamination of the bottle content. It is widely available in Europe and around the world for OTC products, and was recently approved for use with Allergan’s Restasis MultiDose™ eye drops in the US. This system has also been approved by regulatory bodies worldwide for other prescription products, such as for the treatment of increased intraocular pressure. 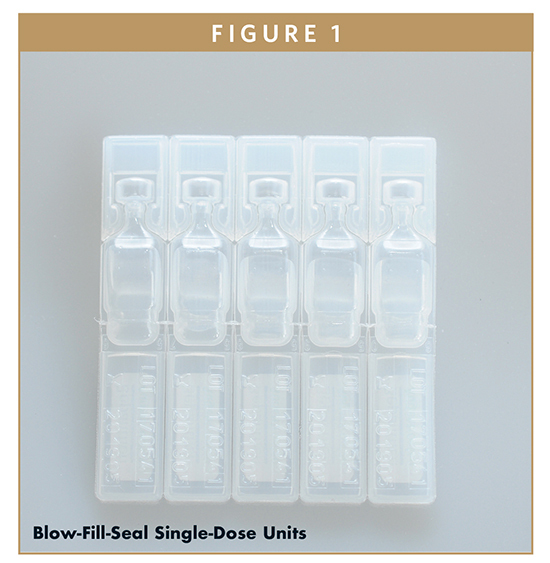 As of today, the most widely-used technology for unpreserved eye drops are blow-fill-seal (BFS) single-dose droppers. BFS is the filling technology used for liquid products during which the polymer containers are manufactured, filled, and sealed in a single cycle. This very simple packaging is a variation of the Rommelag bottlepack system and became established in the field of eye drops in the 1970s. It is used for ophthalmic medications and allows for single doses with a volume between approximately 0.3 ml and 1.0 ml. The process requires substantial overfill, which make the single dose much more expensive compared to multidose dispensers. Depending on the shape and size, such droppers are not always easy to handle for people with limited dexterity and/or visual impairment. A more recently raised concern is the considerable amount of plastic waste generated by this kind of single-use packaging. In 1989, Thea Laboratories introduced the first generation of its ABAK® system.6 A preserved formulation was filtered through a microporous pad, which removed the preservative before the drop reached the eye. The early systems also contained some silver mesh around the dosing orifice. The system was improved step-by-step, and the current version relies on the sterile filtration of the eye drops via a special microporous pad and a hydrophilic membrane. Thus, in the current version, the formulation must not contain any preservatives. The porous pad and the hydrophilic membrane cause substantial resistance in the product flow path, which results in actuation forces in the range of 17-20 N (tested with Hyabak® 0.15% hyaluronic acid from Thea Laboratories). In addition, the design of the pad and the membrane limit the use of this technology to formulations with low viscosity. The first product using Aptar Pharma’s Ophthalmic Squeeze Dispenser was introduced into the market in 2011 with TRB Chemedica’s new VISMED® MULTI eye drops. This preservative-free system follows a purely mechanical approach. The key feature is the spring-loaded tip seal. This spring-loaded valve is located directly below the opening of the tip orifice and does not allow any microbes to migrate from any surfaces or from contacted liquids into the system. The tip seal keeps the system closed until a defined pressure is reached by actuation, then the formulation is forced through the orifice. When the pressure drops at the end of the actuation, the tip seal will immediately close the orifice with an outward movement. No backflow of potentially contaminated medication or other liquid is possible. As opposed to alternative systems for unpreserved ophthalmic medications, the liquid is not filtered, nor does it get in contact with metal parts at any time. Only the venting air required to equilibrate the container after dispensing is sterile filtered using a small filter element, preventing microbial contamination via this route. The mode of actuation is a simple squeezing of the container, which is no different from millions of bottles used for preserved medications. The Ophthalmic Squeeze Dispenser has been well received by the market. 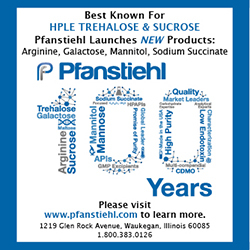 As of today, more than 125 marketed products worldwide are equipped with OSD technology, both for prescription medications and consumer products, such as artificial tears. In 2016, the US FDA approved Allergan’s Restasis MultiDose™ as the first prescription medication using a preservative-free multidose eye dropper. In 2010, Rexam (now Nemera) introduced their Novelia® system. It uses a similar technology as the Ophthalmic Squeeze Dispenser but with some important differences: it features a silicone tube-based valve mechanism named PureFlow™ Technology, and the container is vented via air diffusion through a silicone membrane. To ensure microbial integrity, silver is added to the plastic material of the actuator, protection cap, and silicone valve for the design currently available. Consequently, the patient information leaflets of recently approved prescription products contain a warning “If you have a history of contact hypersensitivity to silver, you should not use this product.”7 In April 2017, Nemera announced the availability of a special vented cap for the Novelia® dropper to address the challenges of particularly sticky formulations. Current publicly available information does not make clear yet if the silver additives might become obsolete with the use of this new cap. Quite a few elements are available and used for their oligodynamic, or antimicrobial, properties in packaging materials, but among these, silver is certainly the dominant additive. Silver is widely used for its antiseptic properties as it is effective and considered safe. In the healthcare industry, silver is used to sanitize water, as wound dressing, or to prevent biofilm formation on catheters. 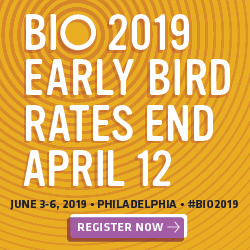 To exert its biocidal effects, silver ions must be released into the formulation or body fluid, so they can then interact with bacteria cell walls following accidental contamination. Therefore, when used in packaging material, it must be taken into consideration that the silver ions will be released and also react with the formulation. Before adding some silver master batches into packaging material, one should consider the consequences for the development of the container closure system. Such an additive should have no impact on the suitability, compatibility, or safety of the construction materials nor compromise the efficacy, stability, or quality of the drug product. Silver is not listed in the USP chapter <232> Elemental Impurities, but is covered within the ICH Guidance for Industry Q3D on Elemental impurities published in 2015. The ICH guidance classifies silver as a Class 2B element, which means they have a reduced probability of occurrence in a drug product. Therefore, under normal conditions, silver can be excluded from the risk assessment unless it is intentionally added during the manufacturing of drug substances, excipients, or other drug product components. Thus, a risk assessment and mitigation strategy is required when silver is used as an antimicrobial in the container closure material. In addition, it must be assumed that the silver interacts with the drug product to exert its protective properties. As a consequence, it is imperative to “evaluate the presence of a particular elemental impurity in the drug product by determining the observed or predicted level of the impurity and comparing with the established PDE” (permitted daily exposure). Based on the recommended dosing regimen for the drug product (dose frequency and dose volume) the likely exposure can be calculated. For silver exposure via the oral route the PDE is 167 μg/day, for parenteral administration 14 μg/day, and for inhalation 7 μg/day, but no value is provided for topical administration (ICH Q3D Guideline). In general, if the calculated exposure values for an element are below the published limits, the container closure system may be used for this particular medication. On the other hand, it should be pointed out that this is not a one-size-fits-all approach, as there are many influencing factors, including formulation properties and dose regimen. Recently, another additive called PyClear from Pylote SA in France emerged in the public domain. The key to this technology are mineral microspheres, which are incorporated into the packaging material and which are generally agreed to be responsible for the “Pylote effect.” An abstract was published showing antimicrobial efficacy of PyClear in some multidose eye droppers in a challenge study.8 Unfortunately, the paper provided no clear explanation for the antimicrobial action mechanism nor for its potential interaction with the formulation. Also, data from real in-use studies and from after longer storage are missing. It is fair to assume that more scientific work is required before this technology finds its way into pharmaceutical product dispensing systems. Regulatory authorities, for good reason, are quite formal regarding data requirements and it is likely that a PDE for the “Pylote effect” needs to be established. As such, adding an antimicrobial into the packaging material will certainly increase the complexity of the development process. Evaluating potential leachable as well as degradation products resulting from a sterilization process and its interactions with the formulation may become cumbersome. This is one reason why Aptar Pharma recommends and follows the aforementioned purely mechanical approach for its Ophthalmic Squeeze Dispenser. Given the importance of vision to one’s quality of life, it is difficult to establish a new packaging concept on the market intended for such a critical product as ophthalmic remedies, regardless of whether these are consumer products or prescription medications. The system must be safe and easy-to-use as no one should risk an eye. In addition, regulatory authorities and notified bodies need to be convinced that the new product is safe. When developing the Ophthalmic Squeeze Dispenser, Aptar Pharma focused primarily on the microbial integrity and robustness of the new packaging system. Keeping this in mind, it is easier to understand that initial versions of the Ophthalmic Squeeze Dispenser required a squeeze force, or actuation force, that was comparably high, in the range of 30 N for a 10-ml bottle containing only 2 ml of liquid. This was due to the high tip seal opening pressure, considered necessary to ensure microbial integrity even under heavy microbial challenge conditions. Based on feedback from the market, authorities and further research, the Ophthalmic Squeeze Dispenser, with its microbial barriers, was optimized without any compromise in terms of microbiological integrity and patient safety. In addition, the container, which is an integral part of the device, was improved. 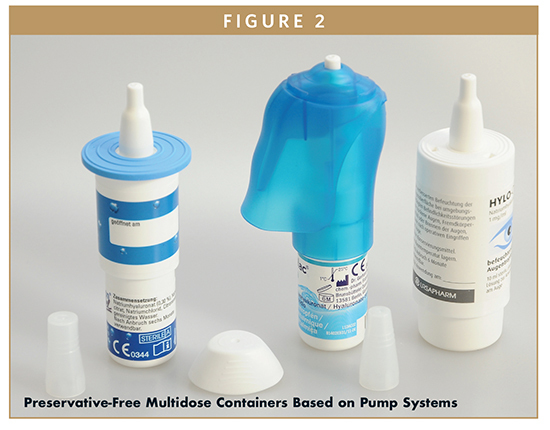 A limited offering back when the technology was originally launched in 2011, today a full range of containers is available that can be used for the Ophthalmic Squeeze Dispenser. These containers vary with respect to volume, geometry, and material (eg, polyethylene and COC) and as such offer various opportunities for both developers and marketers. With the “next-generation” containers available today, the actuation force is notably reduced and is now in the range of 10-20 N without compromising microbial barrier functions. Other additional features have been developed. For example, even though the membrane utilized to filter the incoming air is hydrophobic, some formulations tend to impair the ventilation properties of that membrane. To prevent this, a feature is available to permanently protect the filter from contact with the formulation. 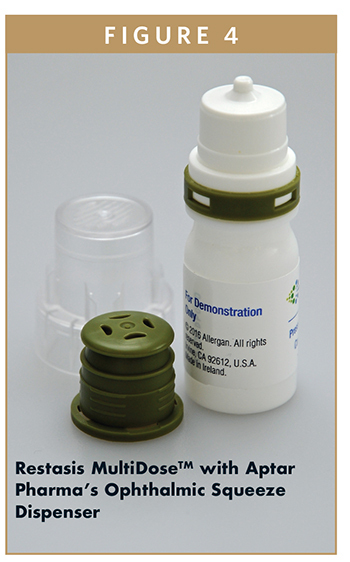 For liquids that tend to crystalize, a cap version with a special liner pad is available that reliably maintains the proper function of the Ophthalmic Squeeze Dispenser. The demand for additional protection prior to first use that are requested from certain regulatory bodies are addressed with a range of different options for the cap design. 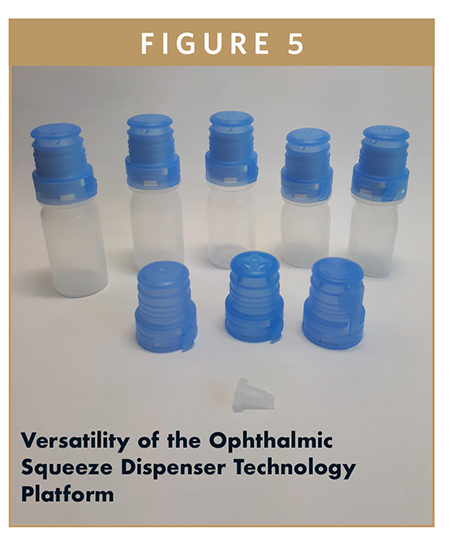 The Ophthalmic Squeeze Dispenser is not a simple dropper but a versatile and flexible technology platform that can be adapted to a wide range of formulations. The process to identify the optimal configuration is well established. Lastly, its purely mechanical approach avoids the hassle associated with the extensive characterization of debatable additives. 1. Die Geschichte der Firma WECK, retrieved from www.weck.de/docs/Geschichte_WECK.pdf in July 2017. 2. Hong J and Bielory L: Allergy to Ophthalmic Preservatives, Curr Opin Allergy Clin Immunol. 2009;9(5):447-453. 3. Baudouin C et al. Prevalence and risk factors for ocular surface disease among patients treated over the long term for glaucoma or ocular hypertension. Eur J Ophthalmol. Epub June 11, 2012. 4. Groß D. The COMOD-System – a preservative free drug therapy against glaucoma. 321-328, in Orgül/Flammer (Editors): Pharmacotherapie in glaucoma, Bern 2000. 5. Birkhoff M and Marx D: New devices for dispensing ophthalmic treatments may be the key to managing the life-cycle of established products with low investments in filling technology. IPI, 2010, Spring edition:44-46. 6. ABAK – pure technology in a bottle, retrieved from http://www.laboratoiresthea.com/medias/abak_brochure_eng.pdf in July 2017. 7. Eyopto 2,5 mg/ml & 5,0 mg/ml timolol eye drops, Package Leaflet, June 2016, retrieved from http://mri.medagencies.org/download/DK_H_2456_001_FinalPL.pdf. 8. Marchin I et al: Unpreserved ophthalmic formula: PYCLEAR® Protection fully controlled risk of contamination with common 3 parts eye dropper, ARVO 2016 Annual Meeting, Abstract Number: 768-C0057. 9. Draft Guidance for Industry and FDA Staff: Premarket Notification [510(k)] Submissions for Medical Devices that Include Antimicrobial Agents. U.S. Department of Health and Human Services, Food and Drug Administration, 2007. 10. Osterberg L and Blaschke T. Adherence to Medication. N Engl J Med. 2005;353:487-497. 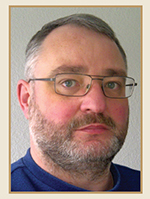 Dr. Degenhard Marx is Director, Scientific Affairs at Aptar Pharma. Following the study of veterinary medicine and the successful completion of his thesis at the University of Leipzig in 1992, he joined the pharmaceutical industry. There, he collected ample experiences in the drug development of anti-inflammatory and cardiovascular drugs. In 2008, he became Business Development Manager within Aptar Pharma. 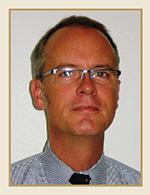 Matthias Birkhoff is Vice President Business Development at Aptar Pharma. In this role he is responsible for Aptar Pharma’s Eye Care program and coordinates research and development activities, microbiological assessment and commercial strategies. Matthias started his career in pharmaceutical sales at a major multinational pharmaco before joining Aptar Pharma nineteen years ago. Prior to his involvement in Business Development and Marketing, Matthias was in charge of sales in the AsiaPacific region. He studied medicine at the University of Dusseldorf, Germany and holds a nursing degree. Matthias has recently spoken at international events, such as NDD (Nasal Drug Delivery), London/UK, PMP (Pharmaceutical Plastics), Copenhagen/Denmark, Interphex, Tokyo/Japan, CPHI, Pharmapack, AAPS, or the IPA conference in Mumbai/India.